Great place, excellent location, amazing hospitality!! 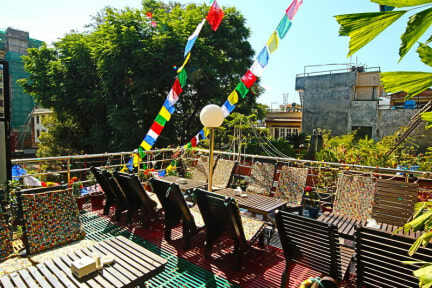 Definitely the best hostel I've ever stayed at in Nepal. Location is perfect, rooms are spacious and with very comfortable beds. Toilets are very clean and with hot water. Free breakfast is huge, varied and delicious. Great restaurant with yummy cheap food and bear. Nice rooftop terrace where it's easy to socialize. Amazing hospitality, great staff with outstanding service and courtesy. Very informative and professional tour desk. I stayed at Shangri-la Botique 3 nights, in a double room with queen size bed and private bathroom. The shower was hot, the room was comfortable and clean, like the other spaces of the hostel, who makes you feel at home. The staff is very friendly and helpful; I get an hiking day tour though the manager Mr. Bino, who is a very kind person. With my booking I've got free breakfast at the cafe on the roof top of the building; every day they do a different, rich and tasty breakfast. I strongly recommend this hostel. The staff was warm and helpful, the rooms big and comfortable, and the location great. Would definitely stay again.